Right before I had seen those two products popping all over the blogosphere, I had come across them on Zuneta, and well, had impulse-ordered, as you do. A lovely, creamy powder in shimmery pastel shades that glides on to skin perfectly, this is every girls must have in their make up bag. Sweep together for allover luminous color. Mix and match to highlight cheeks and dress the eyes too. Complete with travel brush for touch-ups on the go. But, their pictures looked just too good to resist! When I got them, I was very unsure about my purchase, though. I don't know why, I think I was turned down by the packaging which, even if it's black and sleek, felt too plastic for my liking. I guess that at about €42 per quad, I was expecting more luxury, like you get with Givenchy Prisme Visage powders. But obviously, the products counts more, and trying them was what mattered. So I did, and I was pleasantly surprised. Can you see the shading and glow? Of course, what's harder to show than a powder on a FOTD pic? But well, here I am, wearing Summer in Capri in the hollows of my cheeks and South of France on the top of the cheeks and lightly swept over the high points of the face. These powders are an absolute pleasure to work with. They're easy to apply and easy to blend. Capri, even though it can look scary in the pan, is just perfect to warm up a pale face in cool Winter light. It may even be used as a blush if you want. And South of France, despite the little particles of shimmer in it, doesn't look over the top at all and gives to your face that soft focus effect that I love so much and that, so far, I only found in Givenchy powders (yes, them, again). 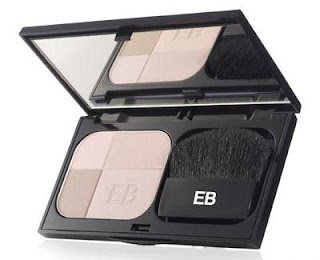 The mirror in the compact is quite large, which is nice, and even though I prefer using my own powder brushes, I did try the little brushes coming with the quads and found they worked quite well. I have to admit that even though I'm not crazy in love with the packaging, it is thin and light and very portable. As I was raving about these powders on a makeup forum, and telling how surprised I was that I ended up liking them so much, someone replied "See, that's the thing about EB products. They just work, and I use mine all the time." And frankly, what better thing is there to say about any product? Note: a third color, Summer in Monte Carlo, has just been released. It would be a more suitable bronzing quad for skins darker than mine. lol thank you! Ditto on the vacation names, this had me at "Summer" ! aaah.. Summer in Capri is so pretty! It is!! I must try it around the eyes, too! This sounds awesome! 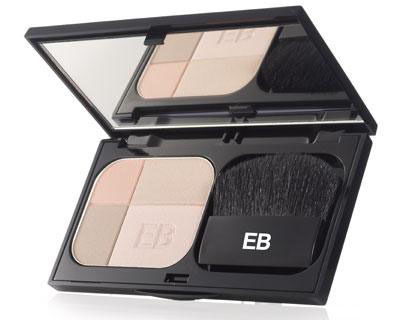 I have been thinking about getting one of these EB powders. I think you might have convinced me! Thanks for the great review! I have South of France and it I never cease to be amazed at how it is so subtle and yet instantly seems to make my complexion look flawless. I definitely want to get Summer in Capri for when the warmer weather hits. The ultimate guide to Illamasqua foundations.